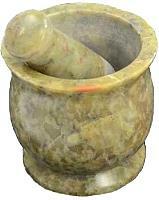 The Mortar and Pestle is a tool for herbalists, alchemists, and kitchen witches. 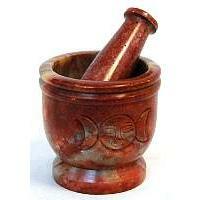 Whether you're looking for wood, stone, or ceramic tools, the mortar and pestle can likely be found right here. 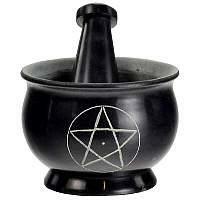 The Mortar and Pestle set is a great way to mash, mix, and grind incense blends, herbal spell mixes, and your assorted other ingredients for your ritual and alchemical magic. 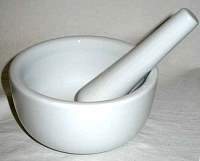 The Mortar and Pestle has existed since the first time a man or woman picked up a stone and used it to grind vegetable , mineral, or meat against another rock. 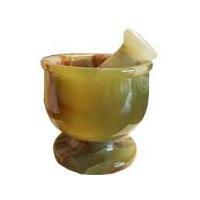 But they've come a long way since then. 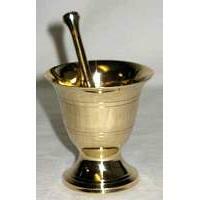 A mortar and pestle is a tool used with herbs, resins or any spell ingredient that you want to crush, grind or mix. 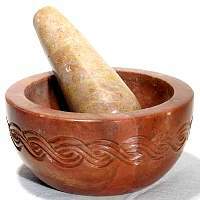 Grinding your own ingredients adds your personal energy to any spell and ritual work.This is a great pagan tool to grind and mix your own incense. 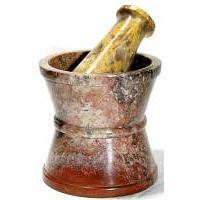 Our Mortar and Pestles come in soapstone, ceramic, coral, marble, onyx, wood, brass and more. 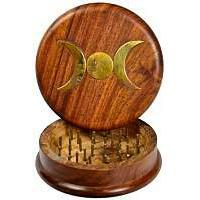 Aesthetically pleasing, however, being made of wood allows f ..